To hear her tell it, Ashleigh Johnson — the newly-minted Olympic gold medalist in women’s water polo — isn’t really into sports. None besides her own, that is. No biking, no hooping or skiing, which she’s never even tried. Hiking is definitely off the “to-do” list after she got caught in a snowstorm with her water polo teammates during a two-mile excursion on the outskirts of Colorado Springs, Colorado, before the 2016 Summer Games in Rio de Janeiro. Johnson may not be a household name like Serena Williams or Simone Biles — not yet, at least. But the bubbly Miami-area native is as talented, determined and insanely athletic as Williams and Biles, two other Olympic champions who excel in tennis and gymnastics, sports that are more well-known, thus guaranteeing better sponsorship deals and wider mainstream success. But Johnson, who stands an impressive 6-feet-1, is every inch the burgeoning icon who competes at an elite international level in a sport that has a cultlike following. Like Simone Manuel, the U.S. freestyle swimming sprinter who also took home gold (and silver) at the 2016 games, Johnson has helped open a space for African-American women, who have historically been absent in swimming events. 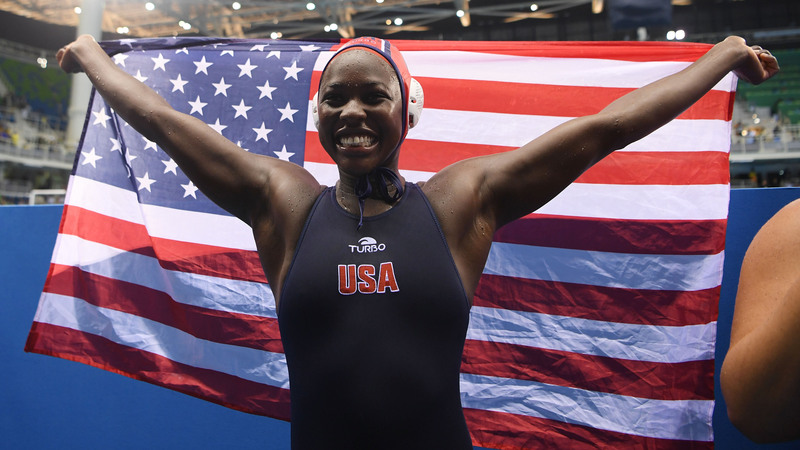 Ashleigh Johnson of United States celebrates winning the women’s water polo gold medal match between the United States and Italy on day 14 of the 2016 Olympic Games at the Olympic Aquatics Stadium on Aug. 19, in Rio de Janeiro. Post-Rio, she has willingly taken on the mantle of de facto ambassador for water polo, a sport that is one of the most physically demanding in the world. Above water, players can throw the ball using only one hand at a time. But the most aggressive action is underwater, where players are kicking, clawing and punching opponents while treading water in the deep end of the pool. No wonder the demands of training for and competing in the Olympics left her spent. After the closing ceremony, Johnson retreated to her family home in Florida and did a lot of nothing. “I asked my mom to cook for me because she makes my favorite foods whenever I go home, and I chilled out,” she admitted. “I was on my own schedule, which I hadn’t been in a long time, so I slept in, went for my own workouts and played with my dog. Now that Johnson is back in her college dorm at Princeton, her rising profile may be one of the things that pushes the sport into a brighter spotlight. It’s also made her an approachable star on the beautiful campus of the Ivy League college, where she regularly gets high fives from students as she walks to and from class. One positive thing about being less visible to the TV viewing public was being able to perform in the pool without facing criticism for her appearance like Gabby Douglas was. Johnson admits feeling kinship with Douglas — especially around the politics and practicalities of being a black female athlete. 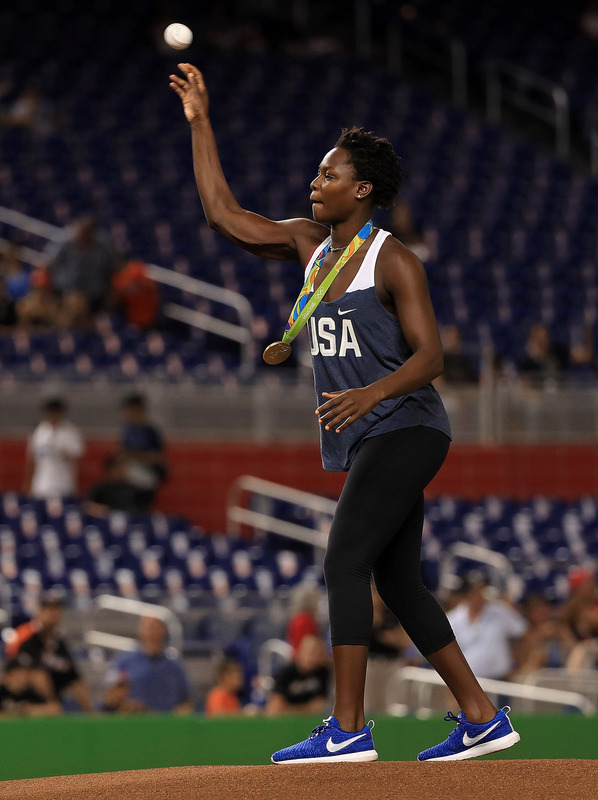 Ashleigh Johnson of the gold medal winning USA water polo team throws out the first pitch during a game between the Miami Marlins and the Philadelphia Phillies at Marlins Park on Sept. 6 in Miami. Hair struggles aside, Johnson doesn’t fret much about the vagaries of fashion “For this past year, I haven’t really thought about being stylish at all! I like to dress comfortable and I don’t try to push anything fashionwise. My style is pretty laid-back. I usually wear black and white if I’m going out, but I like bright colors, probably because I’m from Miami.